Back in May, I wrote about the prospects for veto overrides of the four bills. With respect to the marijuana paraphernalia bill, I stated then that only one Republican voted for the bill. In fact, it was three (Grammer, Kittleman, and Miele). Moreover, there were eight D “no” votes, not six as I wrote. And the bill was SB517. I pretty much screwed up that whole analysis pretty good, huh? Whoops. So instead of only needing the votes of absent delegates, Speaker Mike Busch needs two Democrats who voted against the bill to vote for the override. Thought exercise: if Todd Eberly is right that D legislators seeking to override Hogan vetos are being “Democrats first,” shouldn’t the same analysis apply to Republicans who voted for the vetoed bills but will automatically side with Hogan on the overrides? Aren’t they being “Republicans first”? Hahahaha. Of course not. This is Todd Eberly we’re talking about. Silly me. Back to the discussion. So for a veto override to be successful, Democrats need two votes from among the following: Charlie Barkley, Pam Beidle, Ned Carey, Mark Chang, Barbara Frush, Sheree Sample-Hughes, Ted Sophocleus, and C.T. Wilson. As usual it’s the same pattern – a few first term delegates and some noted contrarians. Frush is the outlier here – she’s not on any of the other lists from my May post. I’d start there, and I am sure the advocates have already done so. [UPDATE] An astute reader points out that per Seventh State (still not linking), the post was actually a guest blog by Adam Pagnucco. I will say two things: first, the email sent out to subscribers made no mention of Pagnucco but credited the story solely to David Lublin. So my assumption was understandable, I submit. Second, in case it’s not clear, I do not have a great deal of respect for David Lublin as a blogger. I think he has undisclosed agendas (in his near-obsession with the Town of Chevy Chase elections this year he never once disclosed his status as the former mayor of the town and his having been a leading opponent of the Purple Line. I also don’t like him because he smeared me in 2014, both on his own and by bringing on John Gallagher, who appeared to have been hired solely to attack me and a few others. I find that kind of blogging obnoxious and sleazy, and I don’t engage in it. My one consolation is that Lublin appears to be just as much of a hack as ever in 2015. I don’t have as much of a beef with Adam Pagnucco. While we’ve had our share of disagreements over the years, I generally find him to be a first rate researcher and a good analyst of data. What I do believe, based on some of his recent work, is that he seems loath to give his readers enough information to replicate his analysis. I wish he’d do more of that, but otherwise I think his work is good. Needless to say, I don’t think that about today’s piece. Quite frankly, it’s crap. But I wouldn’t have written what I wrote in the same tone if I knew it was Pagnucco rather than Lublin behind it. I would have been less snarky and less pissy, to be honest, for the above reasons. And I have no axe to grind with Pagnucco, and I hope he recognizes that. I know he usually writes the “data” pieces for Lublin, but this one was so bad it made it easier for me to believe that Lublin wrote it and more importantly here, that Pagnucco didn’t. Maybe that’s both self-justification and piling on Lublin, but it happens to be true. I don’t know when Lublin updated his post to refer to Pagnucco, so I don’t know that even if I checked I would have gotten the right information. But I didn’t check, and I should have. So taking everything into account, I’m not going to amend what I wrote. That wouldn’t be honest, and I pride myself on that. But I’m putting this update right up on top so people know exactly what’s what and all that. And I’ve made my biases as clear as I can. Read the rest with this update in mind. Thanks for reading. 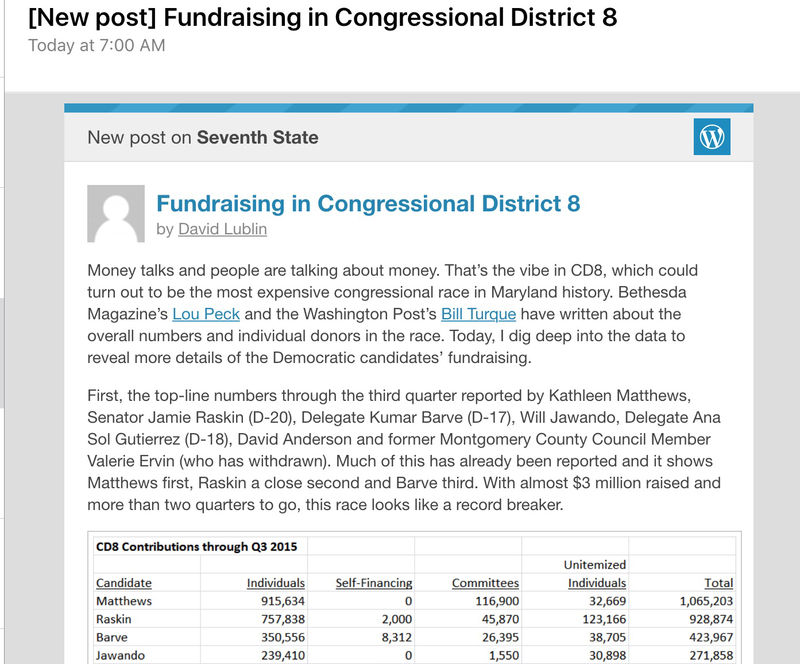 Maybe if David Lublin stopped pretending that Maryland Scramble didn’t exist, he might have written a better CD8 fundraising story this morning (no links, I don’t steer traffic to bloggers who won’t acknowledge my existence). Instead, he’s written a story that any reader here could have told him was poorly reasoned and weakly sourced, and that much of his data had been previously published by me, among others. Moreover, by the time Lublin’s story came out, new developments rendered some of his key assumptions inoperative, which he would have known had he read the several posts I wrote over the past two days about Mayday. Overall, a pretty poor performance, Professor. I’d give it a C-. Data: much of his top line data is repetitive of my October 16 post, and the spreadsheet accompanying it is, I would not so humbly suggest, more informative with far fewer numbers on the page. With multiple quarters of data, it’s better to show the progress of the candidates over time, which in this case shows the major changes that took place in the third quarter. Lublin’s use of only aggregate data masks the importance of the most recent quarter in trying to project out future trends. It also may be why he persists in calling the $200,000 margin between Matthews and Raskin “close,” when in fact it was generated completely during one quarter, which means if that trend continues, it won’t be close at all by the end of the campaign. My data shows this very clearly. Similarly, Lublin aggregates burn rate data for the entire year, when the quarter by quarter data shows that both Matthews and Raskin geared up substantially in the third quarter. It was Q2 when Matthews spent very little, which makes sense considering that she did not enter the race until June 3, less than a month before the end of the quarter. In Q3, her donations went up, Raskin’s went down by $175K, all while he spent more money than she did. All of this gets ignored by Lublin – I have to admire his ability to ignore facts which don’t suit his preferred narrative. Lublin has a chart claiming to represent average donations, but it’s not one that I could replicate. How many donations did each candidate receive? Which ones is Lublin including? We don’t know. Lublin has a chart looking at contributions for the general election, which can’t be used during the primary campaign. He fails to note, however, that such contributions are always from max-out donors who want to give more than the $2700 allowed for the primary. So when he notes that Raskin has $67K in “general election” money to Matthews’ $50K, that means that his super big donors gave more than Matthews’ did. Which Lublin doesn’t mention, presumably because it doesn’t fit his preordained narrative of rich Kathleen versus grassroots Jamie. I also think that it would be far more informative to show general election “dead money” as a percentage of cash on hand, not as a percentage of a concocted number that doesn’t include unitemized individual contributions. Looked at this way, 5.7% of Matthews’ cash on hand is dead money, while dead money constitutes 9.8% of Raskin’s COH – 72% higher than Matthews. I’ve written extensively about how I believe the fixation with in-state versus out of state campaign contributions is not an argument that is going to persuade anyone other than already zealously committed partisans. Lublin doesn’t begin to try to counter my arguments – a problem when you ignore the fact that I’m here, chirping away on a daily basis – but again proceeds from the preconception that out of state money is bad, bad, bad. Hence the multiple charts harping on this non-issue. Question for Lublin and like-minded partisans: if out of state money is so bad, why does Raskin take it? He knows how to draw such lines – he doesn’t take corporate, PAC or partnership money. So the fact that he takes out of state money at all means that he sees it very differently from other categories of donations. Which means that both Raskin and his supporters like Lublin should really stop harping on this issue, because it’s just not a good argument they’re making. Where things really fall apart for Lublin is in his “takeaways from the data.” The first two paragraphs have to win some kind of prize for wrongness – every single assertion is either unrelated to the data, not supported by the data, or demonstrably wrong. Let’s go through it. “Kathleen Matthews’ campaign was predicated on blowing away the rest of the field in fundraising.” There’s nothing in the data to show this, and Lublin doesn’t bother to even attempt to source it. It’s an assumption – an assumption that gives Lublin away as a Raskin fanboy. Money bad, Kathleen has money, Kathleen bad. Not exactly deep thinking there. I think many people believed at the outset that Raskin would raise all the money, that Matthews would get a few big contributions from her rich friends, and that she would be exposed as a weak candidate. So much for the conventional wisdom, hmmmm? “That is happening with the notable exception of Senator Jamie Raskin, who has so far remained close to her.” As I said above, a $200,000 COH gap generated in one quarter is not “close.” Raskin raised $175,000 less in Q3 than Q2, and still spent more than Matthews. Not good. I wrote in my October 16 post that Raskin could turn this around, but there is no data to suggest that this will happen. Or that it won’t. That’s why I said that the fourth quarter is critical. Lublin thinks all is well, which is just more preaching to the converted. “One factor that could change that is if Matthews’ wealthy supporters open a Super PAC on her behalf. Super PACs are not supposed to coordinate directly with candidate campaigns, but they can raise unlimited contributions and spend them on both positive and negative communication. One can easily imagine twenty Matthews supporters each chipping in $100,000, thereby instantaneously bringing an extra $2 million into the race for their candidate.” Here, Lublin stops trying to base his “analysis” on the data and drops any pretense of objectivity. He spins a purely conjectural vision of a Matthews super PAC coming in and having an impact on the race. Hey, Dave, I’ve got a different vision: “one can easily imagine a pro-Raskin campaign finance reform super PAC blundering into CD8 parroting precisely the arguments of the Raskin campaign, raising the specter of illegal coordination and outside influence, while simultaneously undercutting arguments about out or state money and damaging if not destroying the carefully crafted image of Raskin as a good government, grassroots, campaign finance reform advocate kind of guy.” Oh, wait, mine already happened. My bad, sorry. Maybe if you read my stuff . . . oh, never mind. “Senator Raskin’s strategy of community organizing is paying off big-time for his fundraising. He is leading or nearly tied in fundraising in every populous CD8 community except Chevy Chase and his relatively low average contribution rate leaves plenty of room for repeat contributions. His two biggest challenges are countering Matthews’ likely appeal to women and what happens to his campaign once he has to go back to Annapolis for session next January.” Paying off big time? In what universe? He’s $200,000 behind. Oh, wait, I forgot, only in-state contributions count, cause those other ones are icky and have cooties. News flash: out of state dollars spend precisely the same as in-state. So to say Raskin is “leading or nearly tied in fundraising” is delusional. Money is money, no matter how distasteful the inside baseball guys like Lublin might see it. To be fair, the last sentence is actually accurate: Matthews is likely to receive the endorsement of EMILY’s List, which will bring in – oh dear – more outside money. Of course, it’s hard to criticize that source of money without further alienating a crucial chunk of voters, so Lublin doesn’t go down that road. And the challenge of simultaneously being a candidate and a legislator is a real and important issue that has so far not received much public attention. I have my views on the subject but this post is already long enough, so I’ll save that for another day. Bottom line: just because someone puts up a bunch of charts with numbers doesn’t make the “analysis” any better. Suspect numbers, errors and omissions, and a conclusion that has almost no relationship to what has come before but which strips away any pretense of objectivity that “Professor”Lublin clearly aspires to. That’s MY takeaway, and on second thought, I think my grade of C- was very, very generous. Where’s The Fact Checker When I Need Him? Bear with me while I vent my annoyance with the pompous prigs at the Washington Post. The Post hates blogs. It’s not a new thing – their first foray into blogging was based on the idea that they’d enter into relationships with local bloggers, the bloggers would provide content, and the Post would pay them precisely nothing. Like interns, only cheaper. Needless to say, that idea didn’t go anywhere. The Post’s attitude, as far as I can tell, is based on the arrogant, snooty idea that “real journalists” are just vastly superior to some guy with an iPad and an off the shelf WordPress site. Well, that may be so, and I don’t claim to be a journalist, but the reality is that just in the past week, this guy right here has beaten the Post to two major stories: the resignation of Delegate Will Campos and the withdrawal of Valerie Ervin from the CD8 race. What did the Post have to say about that? On Campos, I posted my story, which I held for the better part of the day to confirm it, on September 10 at 5:49 p.m. The Post story, by Arelis Hernandez, wasn’t online until 6:00 a.m. on September 11, more than 12 hours later. Based on how I learned about it, I am as close to 100% certain as I can be that no Post reporter was remotely aware of the story until I posted it. And yet, no acknowledgement or credit was offered. Last week, I posted about Valerie Ervin’s withdrawal from the CD8 race at 9:45 a.m. on September 17. Bethesda Beat posted its article with no more information than I had at 10:21 a.m. Bill Turque of the Post wrote later in the day: “Ervin’s announcement was first reported by Bethesda Beat.” Really? Look me in the eye and tell me that both stories weren’t prompted by my blog post. I dare you. Look, on the one hand, it doesn’t matter, it’s just ego. But I’ve worked hard to develop good sources and sometimes I get the story first. Bethesda Magazine credits me on occasion, and so has the Baltimore Sun. But never the Post – even to the point of inaccurately crediting another outlet for being first when it wasn’t. I’ve tried to find out whether this failure to acknowledge local blogs is just snottiness or whether it’s policy. Neither Turque nor Hernandez has thus far seen fit to call me back and discuss it. And I am very familiar with Hernandez, as I was part of the story when Will Campos got a challenger last year and the case ended up in court (her description this week of her own series of stories on that case is grossly inaccurate – I called her about that, too, but no call back). So I know she is capable of returning a phone call, at least when she wants to. Hey Glenn Kessler – I don’t think your fact check meter has enough Pinocchios on it to cover this situation. Maybe it’s time the local beat reporters stop acting like whiny children and give credit where credit is due. And maybe, just maybe, if I have a story that I don’t want to print for whatever reason, I’ll give it to you. But right now I’m far more likely to call Aaron Kraut or John Fritze than the snobs at the Post. OK, I’m done. Stress released. Back to work breaking cool stories. And beating the Posties as often as I can. I didn’t start out with the idea of being a fact checker/scold for journalists covering Maryland politics, but the state of affairs is not good. I am startled by how often I see basic, demonstrably provable facts misstated by one media outlet or another. Part of this is that I am an obsessive nerd who has around 25 politics and election-related Google alerts frequently pinging, and am constantly on the alert for other interesting news and gossip. But part of it is that facts get misstated entirely too often by those who are supposed to be sources of accurate information. So when I read in a Maryland Reporter article yesterday that the “primary election is scheduled for April 5, 2016,” when both the House (HB396) and Senate (SB204) have passed an identical bill to move the primary to April 26, it does not sit well. I also disagree with the premise of the article that Anne Arundel Dems could decide the CD4 primary, but I digress – that’s a different question. The fact that I gave this date change its very own post on April 7 (two weeks ago! ), however, amuses me endlessly, as it allows me to get all righteously indignant and say “now if you read Maryland Scramble, you wouldn’t have made this mistake.” My work here is done. The fact that I am enjoying this so much does not exactly present me in the best light. But someone’s gotta keep ’em honest, right? Right?